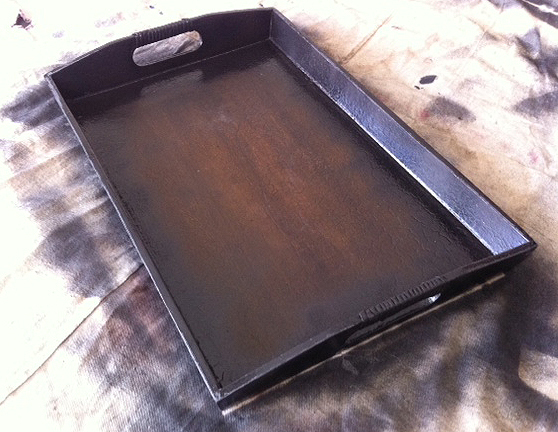 I had an old tray that was made of wood – but it had gotten a lot of wear and tear over the years. It was a great size so I thought I’d try to pretty it up a bit. It was also the perfect thing to go on the new chest I refinished for my sister’s home office. A tray on this chest will not only add a nice design element to the space, but it will also serve the purpose of a table top since the wicker chest doesn’t have a completely flat surface. 2. 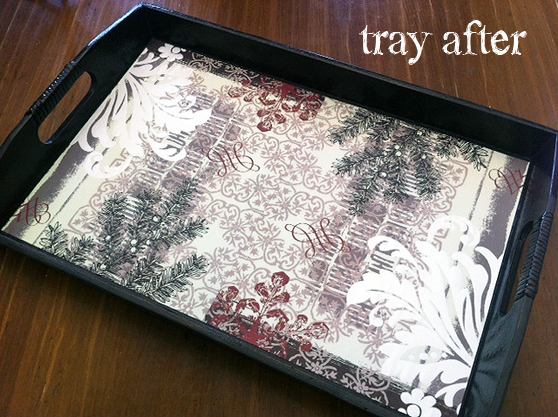 Cut scrapbook paper to fit the bottom of the tray. I had to tape 2 pieces of paper together and then cut to fit. My paper has an asymmetrical pattern so when putting the 2 sheets together, I tried to make it look like as unified as possible. 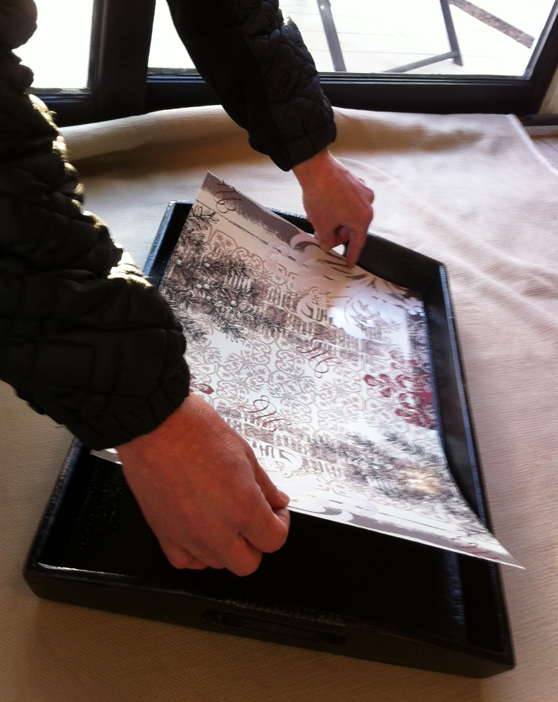 Then, adhere the paper to the bottom of the tray with Scotch Super 77 Adhesive. 3. 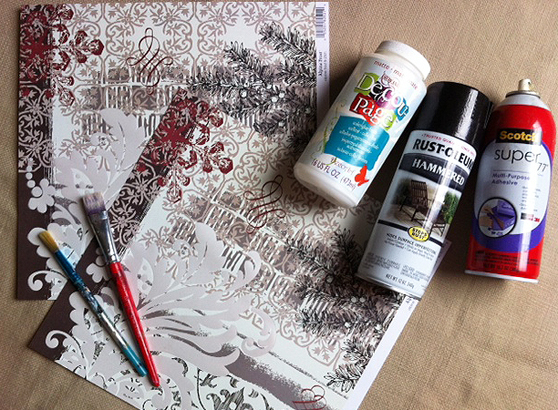 Apply a generous coat of decoupage glue over the paper. Let dry and apply another generous coat of glue. Use a small paint brush to apply the glue and get the edges and corners good. Try to work out any of the air bubbles but be careful not to rip the paper, it will become softer as more glue is applied. Let dry. After it’s dry, it should look as if there is a coat of shallack over the paper to protect the tray from rips, spills, etc. I kept this design pretty simple, but you can also add in other elements like an initial, textured papers, fabrics, words, and even embellishment like shells or sea glass to a corner. Another idea is to get a piece of plexiglass cut to fit the bottom of the tray and put photographs or momentoes under the glass. I also did a larger tray that sits on an ottoman in our kids’s play area. 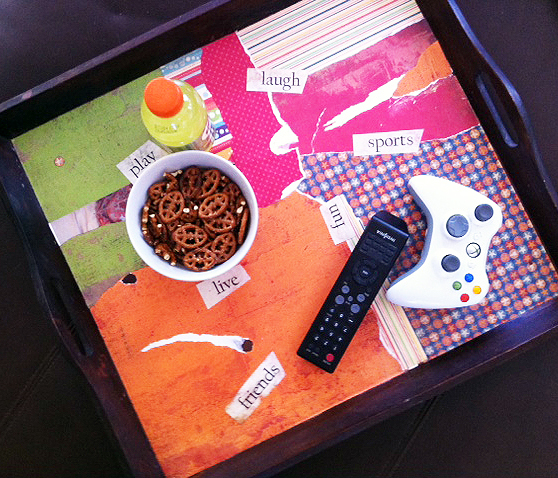 The tray hold all the kids drinks, Xbox gadgets and snack bowls. Works great for them! 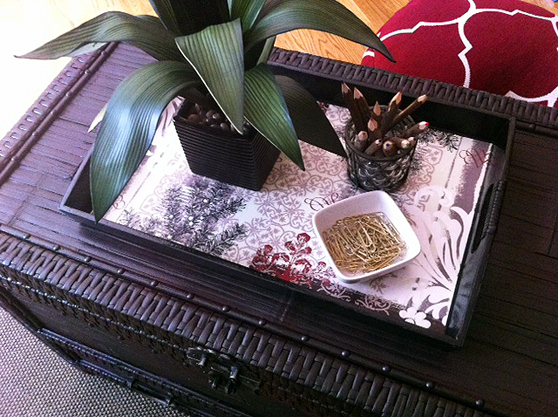 Arrange the tray with your favorite items. Here it is finished on top of the wicker trunk in my sister’s home office. 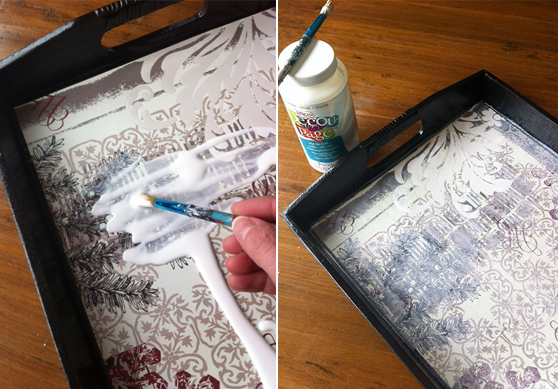 Click here to follow me on pinterest to see some other great tray ideas – maybe you’ll add new life to an old tray you’ve had too. Enjoy!